Chiropractic care is not for everyone. Chiropractic care is a drug-free, noninvasive way to manage pain and improve function. Chiropractic care is not a “cure all” for any and all health problems. Chiropractic care has been shown to be very effective for relieving a variety of common conditions like lower back pain, sciatic leg pain, neck pain, and headaches. But, because these types of aches and pains can have a variety of causes, it is important to consult with a doctor of chiropractic to determine if your condition would be responsive to chiropractic care. NOTE: Only a chiropractic doctor (not Dr. Oz; we love him, but he is only a cardiologist) can tell you if your condition may be helped with chiropractic care. 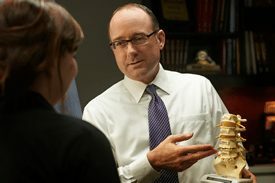 What’s causing your neck or low back pain? Most neck and back pain is caused by dysfunctional spinal joints that cause over-active spinal nerves. Chiropractic manipulation is believed to calm these nerves. Chiropractic is a health care profession that focuses on the relationship between the body’s structure—mainly the spine—and its functioning. Although practitioners may use a variety of treatment approaches, they primarily perform adjustments (manipulations) to the spine with the goal of alleviating pain, improving function, and supporting the body’s natural ability to heal itself. Anyone whose pain is not being generated by joint dysfunction. Anyone who prefers to mask their back and neck pain with NSAIDS. Anyone who just wants instant, temporary relief from pain. Chiropractic doctors are portal-of-entry physicians. This means you do not need a referral to consult with or be examined and treated by a chiropractor. So, tell your chiropractor about all your medical conditions and medications so he/she can make an accurate diagnosis. Reactions following chiropractic manipulations are minimal. The most common reaction to chiropractic adjustment spinal manipulation is temporary aching or soreness in the spinal joints or muscles. If this aching or soreness occurs, it is usually within the first few hours post-treatment and does not last longer than 24 hours after the chiropractic adjustment. An ice pack often reduces the symptoms more quickly. On the most extreme side of chiropractic-related problems, vertebrobasilar artery (VBA) stroke, have been reported and critics of chiropractic care use this by recommending no spinal manipulation of the cervical spine. In reality, because the chances of serious side-effects from chiropractic manipulation are extremely remote, chiropractors enjoy very low malpractice insurance rates compared to other specialties. • Follow the treatment plan exactly as your chiropractor recommends. • Manage your expectations. Most conditions did not happen overnight and therefore do not respond overnight. Often times you will feel no different right after an adjustment. However, most conditions do show significant improvement within the first few sessions and/or two weeks of care. • Take it easy for the first two (2) hours after a treatment session. Even if you feel better, allow time for your body to respond to your adjustment. There is a difference between feeling better and being stable. • Don’t change or stop your treatment plan by canceling or missing appointments without first talking with your chiropractor. • Don’t use a heating pad, but if you must, use it for no more than twenty (20) minutes at a time. • Don’t use any more pain relief medication than you absolutely need. It is very important that you know your body’s limitations or your condition may be exacerbated, and your recovery may be delayed. Chiropractic care can provide significant relief from back and neck pain. In some patients, chiropractic works in as early as the first week of treatment.